Designed to appeal to the book lover, the Macmillan Collector’s Library is a series of beautiful gift editions of much-loved classic titles. Macmillan Collector’s Library are books to love and treasure. Confessions of an English Opium Eater is considered to be the first published autobiography to explore the lure and effects of addiction. 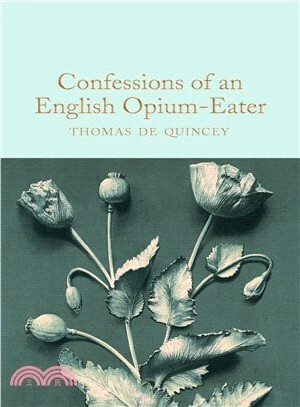 Explosive and unforgiving, De Quincy describes in searing detail the pleasure, pain and mind expanding powers of opium. This edition of Confessions of an English Opium Eater is introduced by biographer, critic and academic Dr Frances Wilson, author of Guilty Thing: A Life of Thomas De Quincey. In Confessions of an English Opium Eater, Thomas de Quincey takes us on a journey from his grammar school childhood to his homeless adolescence in Wales, from befriending prostitutes during his nocturnal wanderings in London to enrolling at Oxford University only to drop out when his drug use overcame him. Thrust into a disorientating world of extreme euphoria and vivid nightmares, De Quincey’s life story is both unpredictable and deeply personal.